Crow Canyon Software is going to Europe, specifically Dublin, Ireland, for the annual “European SharePoint, Office 365, & Azure Conference”. This event, running November 13 to 16, is the largest SharePoint and Office 365 gathering in Europe. Crow Canyon, a Silver Sponsor, will be in booth #52, meeting potential customers, showing demos of its SharePoint & Office 365 productivity applications, and raffling off prizes. The European SharePoint Conference, held at the Dublin Convention Center in downtown Dublin, begins November 13th with full-day pre-conference workshops. The conference continues with three days of activities including 100+ sessions led by SharePoint experts from around the world. The Expo Hall is open November 14 to 16. For more information on the conference, see: http://www.sharepointeurope.com. 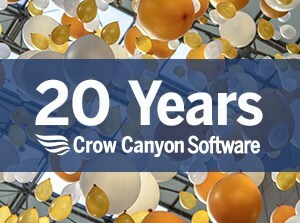 If registering, use Crow Canyon’s discount code ESPC17SP for a 10% discount. Our programs run in all versions of SharePoint, including on-premises and Office 365/SharePoint Online. They are easily installed and configured, with no coding, to meet your organization’s needs.